Plant-based eating was without a doubt, one of the top food trends of 2018, if not the absolute top trend. The rise of plant-based eating meant the addition of vegan options to tons of menus. They were even popping up in the most unexpected meat and dairy-heavy fast food chains. If you’re vegan or just prefer to eat plant-based, you probably never expected to find options at certain restaurants. Now you can dine almost anywhere with your non-vegan friends. Here are 15 of the most exciting vegan additions to popular restaurants and fast food chains! The impossible burger has taken the meat-eating world by storm. People are amazed at how much it tastes and looks like meat. Popular fast food chain, White Castle took notice and added impossible sliders to it’s menu! Just remember to order without cheese to make it vegan. The JUST Egg product is a plant-based alternative to eggs made of mung beans. It looks and tastes very much like eggs. The JUST egg debuted at Veggie Grill this year and is available in some retail stores as well. It’s a great option for those craving eggy breakfast foods. The Alamo Draft House didn’t just debut one or two vegan options. They added an actual vegan menu which includes a Beyond Meat cheeseburger, avocado toast, a southwestern tofu quinoa bowl, a curry chickpea salad, and crispy buffalo cauliflower. Del Taco is the first fast-food, drive-thru restaurant to offer a vegan taco with beyond meat crumbles. How exciting? If you’re in LA, you can drive through and get a beyond taco or a beyond avocado taco! There was no shortage of vegan patties in 2018. Shake Shack is another restaurant that added a vegan patty to their menu called the “Veggie Shack.” It comes with a vegan sauce, but remember to ask them to leave the cheese out. McDonald’s is one place you definitely wouldn’t expect to find vegan options. However, their vegan McAloo Tikki has been very successful abroad, so they’ve brought it to the US! It’s currently available in their Chicago headquarters. Order without the mayo to make it vegan. Ikea is already home to some pretty great vegan meatballs, but now they also offer a vegan hot dog! And it’s doing great. In just its first two months in Europe, one million veggie dogs were sold. The famous, foul-mouthed, tough, and funny chef, Gordon Ramsay is not one to have ever shown much interest in vegan food. But even he knows what the people want! 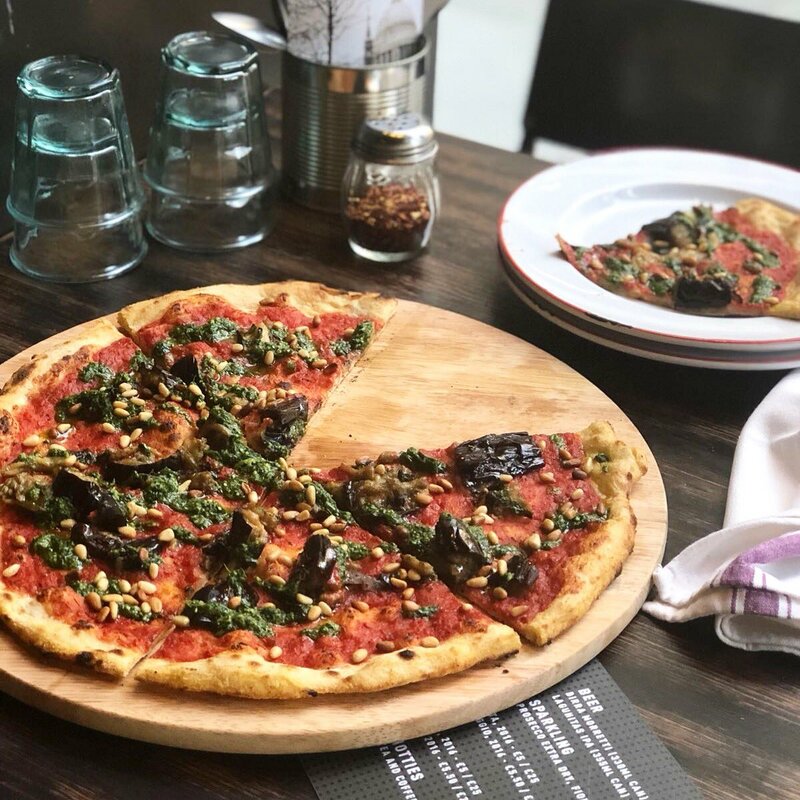 This year, a vegan pizza was added to the menu at Gordon Ramsay’s Street Pizza restaurant. Costco introduced a vegan al pastor salad and an açai bowl to its food court this year! They really understand the value of vegan food though because they even switched out a popular meat dish to include these vegan options. A&W is Canada’s largest burger chain. They added the Beyond Burger to their menu this year! TGI Fridays also introduced the Beyond Burger to their menu this year. Just remember to order without cheese and the Fridays sauce to make it vegan. 2018 was a year of expansion for Beyond Meat. Their crumbles were also added to the menu at Freebirds World Burrito and can be added to burritos, bowls, quesadillas, and tacos! Panera Bread expanded their list of vegan options this year by adding two vegan broth bowls. They added the Vegan Lentil Quinoa Broth Bowl and the Soba Noodle Broth Bowl with Edamame. The Impossible burger has also seen quite a lot of expansion this year arriving at popular restaurant chains such as Applebee’s and Cheesecake Factory! It’s very exciting to see so many vegan options being introduced in popular restaurants and fast food chains. In such popular restaurants, you may just have to ask them about the dairy products such as cheese and sauces, but other than that, you can enjoy plenty of yummy vegan options when going out to eat. And there are only more new ones constantly being added! To make your own delicious plant-based meals, download our Food Monster App where we have over 15,000 vegan and allergy-friendly recipes!